To commemorate the start of construction of the 132 MWdc Merredin Solar Farm, Risen Energy (Australia) conducted a Ground Breaking Ceremony with Honourable Mia Davies, MLA, Member for Central Wheatbelt, Cr Ken Hooper, President, Shire of Merredin and Eric Lee, General Manager Risen Energy (Australia) on Friday March 15. This ceremony reinforces the importance of the working relationship between the State, Council and Risen Energy (Australia) in developing such a significant project within the region. Risen Energy (Australia) is developing the Merredin Solar Farm, the largest solar farm committed to construction in Western Australia. Once completed the solar farm will have an expected output of 281GWh of electricity annually, generating enough green energy to power approximately 42,000 Western Australian homes. The Merredin Solar Farm is located on 460ha of former farming and grazing country adjacent to the Western Power Merredin Terminal and will connect to the Merredin Terminal at 220kV. A diesel power station is also located adjacent to the Terminal on Robartson Road. Initially construction will involve bulk earthworks to prepare the site for installation of the solar panels and substation equipment. Full construction of the solar installation starts soon and will continue through to mid-late 2019. Merredin Solar Farm will commission and commence power sales in Q4 2019. As owners of the Merredin Solar Farm project, Risen Energy (Australia) will progress the project from detailed engineering design, through construction, commissioning and ultimately the operation of the solar farm. They will supply the latest PV panel technology to allow it to supply power to the grid. Ultimately, integrated battery storage will be incorporated in the solar farm to provide continuous power during periods of peak demand. The Merredin Solar Farm will endeavour to use as many local resources as is possible including labour, equipment, contractors and accommodation. It is anticipated that around 200 jobs will be created during the construction phase of the plant which will have approximately 360,000 solar panels installed at the site. Once operational, the solar farm will require 3-5 full time workers to maintain the installation. When completed the Merredin Solar Farm will supply power to homes, businesses and industries in the wheatbelt region and the South West. The completed facility has a projected life of 30 years. At the end of the facility’s useful operating life, all physical infrastructure will be removed, and the land returned to its former agricultural use. The Merredin Solar Farm has worked closely with local government to deliver the approvals for the Merredin Solar Farm project. This has included focusing on planning consents at a local, regional and state level. The development approvals established certain conditions on the solar farm’s construction. These include sourcing permits for elements of the installation, the upgrading of identified roads potentially impacted by the development and compliance with environmental requirements. Merredin Solar Farm will continue to liaise with the Merredin Shire and government agencies to ensure these requirements are satisfied. Merredin Solar Farm has worked closely with the State Government’s corporate entity, Western Power to determine the most appropriate connection to the local electricity grid. This connection will be into the existing high voltage Merredin Terminal Substation, which ultimately feeds into the Western Australian transmission network. Western Power is currently expanding its facility at the Merredin Terminal to enable the solar farm to connect. Merredin council’s support of renewables has created a renewable energy hotspot for this Wheatbelt town. Risen Energy (Australia) is one of the largest and most reliable suppliers of solar panels within Australia. “Merredin Solar Farm is our second acquisition of a utility-scale solar farm which we will progress from detailed engineering design, through construction, commissioning and ultimately the operation. Our first acquisition was for the 100 megawatt (AC) Yarranlea Solar Farm in South West Queensland where construction is underway.” said John Zhong, Project Development & Investment Director, Risen Energy (Australia). “Risen Energy (Australia)’s long term goal is the establishment of 2GW of solar farms over the next few years. This reinforces our intention of becoming a key player in the national solar industry.” said Zhong. Risen Energy (Australia) has had an established presence in the Australian market since 2008, supplying solar PV panels for the retail market. Its long-term goal also includes the funding, constructing and operating commercial and utility-scale solar projects. Risen Energy was founded in 1986 and is a leading China-based PV solutions provider that is traded as an A-share on China’s Shenzhen Stock Exchange. Risen Energy has over 6,500 employees globally and are the seventh largest PV module supplier in the world, completing over thousands of grid-connected projects globally, including self-developed projects that they manage directly. Risen Energy’s 100 megawatts AC Yarranlea Solar Farm is well into the second stage of construction. The solar installation is located near Pittsworth, approximately 50km west of Toowoomba on the Darling Downs. The solar farm is approximately 250ha in area, consisting of over 360,000 solar panels mounted on a single axis tracking system and will generate and deliver clean, renewable electricity to power up to 32,000 homes. It will connect to the power grid using the existing Ergon Energy infrastructure, located close to the development site. This will allow transmission of power into the Middle Ridge Bulk Supply Substation for ultimate use in the Toowoomba and Darling Downs area. The bulk earthworks have been completed by Sedl civil contractors, a local Toowoomba based firm and the substation installation is being progressed by Yurika, the “commercial” arm of Energy Queensland. The ongoing survey works for construction monitoring are being done by Byrne Surveyors, a long-established Toowoomba survey firm. For over 50 years Byrne Surveyors has undertaken surveys throughout South West Queensland, covering the Darling Downs, Lockyer Valley, Granite Belt and Maranoa Districts. The external fencing of the solar farm is almost complete. The primary construction contract has been awarded to Monford Group, a construction firm with sound solar farm experience. Construction of the solar farm started in earnest early in the new year with pile driving of the supports for the panel trackers. Tracker assembly will commence mid-February and the first panels will be mounted shortly thereafter. The Yarranlea Solar Farm is utilising local resources where ever possible and we are working with the local community to deliver the project with a minimum of disruption. The Solar Farm will contribute to the green footprint of the state in support of the Queensland Government’s Green Policy. As owners of the Yarranlea Solar Farm project, Risen Energy is progressing the project from detailed engineering design, through construction, commissioning and ultimately the operation of the solar farm. It is anticipated that approximately 200 positions will be created during the construction of the Yarranlea Solar Farm. Construction of the solar installation is scheduled to be completed October 2019 and once commissioned will supply green power to homes, businesses and industries in the Toowoomba and Darling Downs area. The completed facility has a projected life of 30 years. At the end of the facility’s useful operating life, all physical infrastructure will be removed, and the land returned to its former agricultural use. “Risen Energy (Australia)’s long term goal is the establishment of 2GW of solar farms over the next few years. This reinforces our intention of becoming a key player in the national solar industry.” said John Zhong, Project Development & Investment Director, Risen Energy (Australia). “Our first utility-scale solar farm acquisition was Yarranlea Solar Farm and construction is well underway. Merredin Solar Farm in the Central Wheatbelt area of Western Australia is our second, which we will progress from detailed engineering design, through construction, commissioning and ultimately the operation” said Zhong. Risen Energy has formally connected a 40MW photovoltaic power station project in Kazakhstan to the national grid. With this development, Risen Energy stands as the first privately-owned enterprise investing in the construction of PV installations in Kazakhstan. The installation, located in Gulshat, Aktogay District, Karaganda Region of Kazakhstan, features 325W Poly 1500VDC polycrystalline modules and is expected to generate 50 million kilowatt-hours of electricity annually. Risen Hong Kong general manager Champion Yuan said: “The project held its groundbreaking ceremony in June 2018 and connected to the grid in December, fully reflecting the strength and efficiency of Risen Energy’s workforce. As a result of designing and building the 40MW power plant, we have a comprehensive understanding of the market and regulatory environment in Kazakhstan. Risen Energy to acquire Merredin Solar Farm from Ingenious- backed Stellata Energy with the Share Purchase Agreement executed in October 2018. Merredin Solar Farm is a proposed development for a 100 MW (AC) Solar PV farm at Merredin in Western Australia’s central wheatbelt. Merredin Solar Farm – Phase 1 will consist of circa 405,000 tracking solar PV modules covering an area of roughly 350 hectares, with an expected output of 281GWh of electricity per annum. The Merredin Solar Farm will generate and deliver clean, renewable electricity into the South West Interconnected System (SWIS) each year making a major contribution to Western Australia’s greenhouse gas reductions. Once connected Merredin Solar Farm will generate enough energy to power approximately 42,000 Western Australian homes annually. “Risen Energy (Australia) is going to invest progressively in an excess of 2 GW of renewable projects in Australia with further investments in storage in the future. We will be acquiring projects that are shovel ready, projects that are looking for financial and/or EPC partner, projects that are looking for a co-developer.” said John Zhong, Project Development & Investment Director, Risen Energy (Australia). “Risen Energy will fund some equity of the Merredin Solar Farm project with an aim to achieve financial close in late 2018.” continued Zhong. Sebastian Speight, MD of Ingenious Infrastructure (joint venture partner in Stellata), commented “We are delighted to have reached this milestone with Risen and are looking forward to getting the project into construction at the end of 2018”. Stellata is a joint venture comprising Stellata Energy and London based Ingenious Infrastructure, with the JV team comprising more than 35 industry specialists. The Stellata JV team have developed over 500MW of utility scale solar PV assets across the UK and Europe, with Merredin Solar Farm representing the successful development of their first utility scale solar project in Australia. The Queensland Government released their Queensland Solar Farm Guidelines at Risen Energy’s Yarranlea Solar Farm. The Queensland Solar Farm Guidelines provide practical guidance for communities’ landowners and project proponents. “These guidelines are a clear checklist for local governments about what’s needed for sustainable, community and industry led large-scale solar development.” said Dr Lynham, Queensland Minister for National Resources, Mines and Energy. ‘Over the past three years Queensland has seen an unprecedented wave of renewable energy investment worth $1.3 billion with the construction of 13 large-scale solar projects from Lakeland in the Far North to Dalby in the south-west”. “In the south-west alone, five large-scale solar projects are either underway or financially committed, bringing almost $640 million in investment and 670 jobs to the south-west, as well as more than 300 megawatts of renewable energy for the grid. 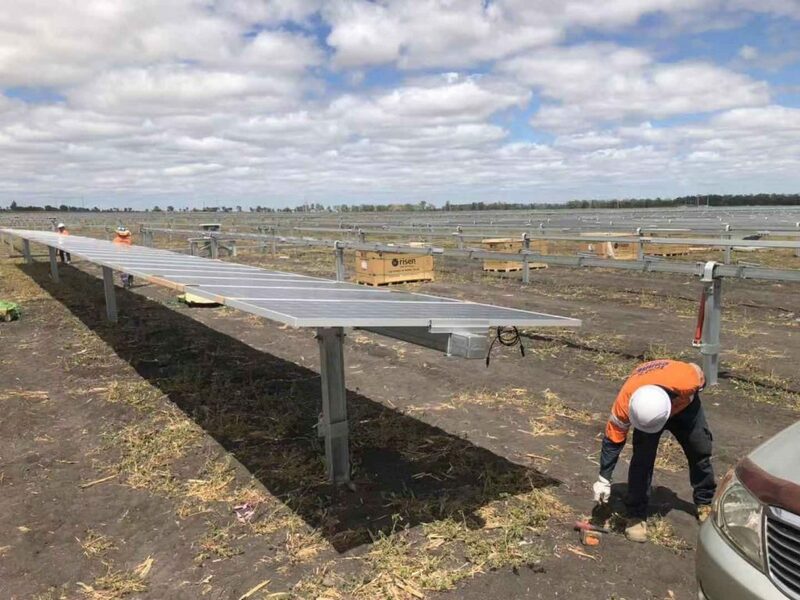 One of these large-scale solar projects under construction in Queensland’s south-west is Risen Energy’s Yarranlea Solar Farm, which was the venue for the Queensland Solar Farm Guidelines release. The Yarranlea Solar Farm is in the second stage of construction and is located near Pittsworth, approximately 50km west of Toowoomba on the Darling Downs. The farm will be approximately 250ha in area and have a generation capacity of approximately 100 megawatt (AC), being sufficient to power up to 32,000 homes. The Yarranlea Solar Farm is utilising local resources where ever possible and we are working with the local community to deliver the project with a minimum of disruption. The Solar Farm will contribute to the green footprint of the state in support of the Queensland Government’s Green Policy. “Yarranlea Solar and Risen Energy strongly support the Queensland Government’s initiative in developing the Queensland Solar Farm Guidelines and submitted a comprehensive review and provided positive feedback to the Government on these guidelines” said John Zhong, Project Development & Investment Director, Risen Energy (Australia). “Risen Energy Australia has assembled an experienced development team with strong power industry backgrounds and have been able to provide a practical review aiding the development of the Guidelines” continued Zhong. “Risen’s future developments will address and accord with the Guidelines, providing a roadmap for the engagement of the communities potentially impacted by development of Risen Energy projects.” said Zhong. For traditional owners, communities and landholders the guidelines outline approval processes, technical and environmental consideration, ways to give feedback, information on the stages of solar development and what a new solar project can mean for a community. For industry, these guidelines provide a one-stop-shop guide on navigating government development approvals, expectations about best practice to engage the local community, location guidance and the legal framework which governs solar farm developments. To commemorate this site visit a ceremonial tree was be planted as part of the 7,500 trees for the screening vegetation supplied by McKinlay Nursery in Pittsworth. Purchasing these through a the McKinlay Nursery aligns with Risen Energy’s focus on using local resources where possible. During this site visit the bulk earthworks undertaken to prepare the site for installation of the solar panels and the substation construction were viewed. The earthworks are being undertaken by Sedl Constructions, a local Toowoomba firm who have been engaged to complete the multi-million dollar earth works contract. The substation installation is being progressed by Yurika, the “commercial” arm of Energy Queensland. Key attendees from Yarranlea Solar and Risen Energy (Australia) include Eric Lee, General Manager Risen Energy (Australia); John Zhong, Development and Investment Director, Risen Energy (Australia); Ross Tabaie, EPC Director; Chao Jia, Sales Director Risen Energy (Australia); Archie Chen, CFO Risen Energy (Australia); and Toby Menezes, Project Manager. As owners of the Yarranlea Solar Farm project, Risen Energy is progressing the project from detailed engineering design, through construction, commissioning and ultimately the operation of the solar farm. The main contract for the construction and installation of the solar farm is in the assessment stage. We would expect the successful tender to mobilise to site in mid- October. Yarranlea Solar will be outsourcing construction contracts for the solar farm. This is specialised work, and local contractors and firms will be utilised where possible. It is anticipated that approximately 200 positions will be created during the construction of the Yarranlea Solar farm which will have approximately 400,000 solar panels installed at the site. The workforce on site at any one time will vary as the project cycles through various construction phases (civil works, foundations, assembly, electrical assembly, cabling, commissioning). Construction of the solar installation started mid-year and will continue through to 2019. 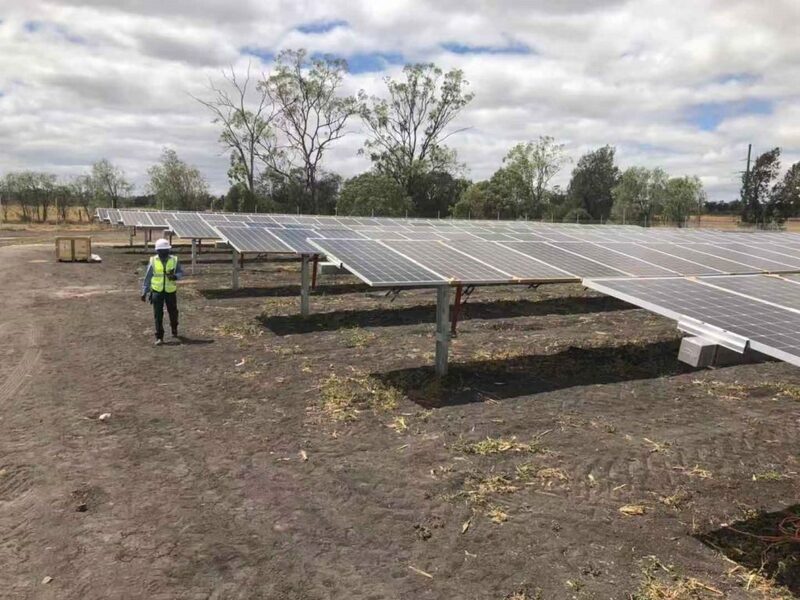 Yarranlea Solar has engaged Yurika, the commercial arm of Energy Queensland to develop a switching station which will allow the solar farm to connect to the existing 110kV network. Works on the switching station and farm substation have commenced. In recognition of the importance of supporting local businesses, the Yarranlea Solar management team has arranged for accommodation within the town of Pittsworth. The 100 megawatts AC Yarranlea Solar Farm will connect to the power grid using the existing Ergon Energy infrastructure, located close to the development site. This will allow transmission of power into the Middle Ridge Bulk Supply Substation for ultimate use in the Toowoomba and Darling Downs area. Yarranlea Solar Farm, Queensland will use the latest Risen Energy PV panel technology and eventually integrate battery storage to allow it to supply power to the grid during periods of peak demand. The completed facility will have an operating life of 30 years, with the option for extensions. At the end of the facility’s useful operating life, all physical infrastructure will be decommissioned, and the land returned to its former agricultural use. Risen Energy has over 6500 employees globally and are the seventh largest PV module supplier in the world, completing over thousands of grid-connected projects globally, including self-developed projects that they manage directly. Toowoomba based earthworks and surveying firms have moved into the second stage of the construction of the Yarranlea Solar Farm, Queensland. Preliminary works have been completed, with the next phase of construction involving bulk earthworks to prepare the site for installation of the solar panels and substation equipment. The Yarranlea Solar project bulk earthworks contract was awarded to Sedl Contractors, the Toowoomba based, family owned earth moving civil contractors. The ongoing survey works have been allocated to local firm Byrne Surveyors, a long-established Toowoomba survey firm. For over 50 years Byrne Surveyors has undertaken surveys throughout South West Queensland, covering the Darling Downs, Lockyer Valley, Granite Belt and Maranoa Districts. Planting of screening vegetation is also scheduled to commence soon. As owners of the Yarranlea Solar Farm project, Risen Energy will progress the project from detailed engineering design, through construction, commissioning and ultimately the operation of the solar farm. Yarranlea Solar is working with Ergon to develop a switching station which will allow the solar farm to connect to the existing 110kV network. The Yarranlea Solar management team is currently addressing accommodation arrangements within the town of Pittsworth. Yarranlea Solar Farm is located near Pittsworth, approximately 50km west of Toowoomba on the Darling Downs. The farm will be approximately 250ha in area and have a generation capacity of approximately 100 megawatts DC, being sufficient to power up to 32,000 homes. The project will connect to the power grid using the existing Ergon Energy infrastructure, located close to the development site. This will allow transmission of power into the Middle Ridge Bulk Supply Substation for ultimate use in the Toowoomba and Darling Downs area. Risen Energy starts construction of Yarranlea Solar Farm project in May. To commemorate the start of construction of the 100 megawatt DC Yarranlea Solar Farm, Risen Energy conducted a Ground Breaking Ceremony with Mr Patrick (Pat) Weir MP, LNP, Member for Condamine, and Paul Antonio – Mayor Toowoomba Regional Council. This ceremony reinforces the working relationship between the State, Council and Risen Energy in developing such a significant project within the region. Initially construction will involve bulk earthworks to prepare the site for installation of the solar panels and substation equipment. Planting of screening vegetation will also be undertaken at this early stage. Full construction of the solar installation is expected to start mid-year and continue through to early 2019. Yarranlea Solar will be working with Ergon to develop a switching station which will allow the solar farm to connect to the existing 110kV network. Around 200 jobs will be created during the construction phase of the plant which will have approximately 400,000 solar panels installed at the site. The Yarranlea Solar management team is currently finalising accommodation arrangements within the town of Pittsworth. Yarranlea Solar Farm is located near Pittsworth, approximately 50km west of Toowoomba on the Darling Downs. The farm will be approximately 250ha in area and have a generation capacity of approximately 121 megawatt DC, being sufficient to power up to 32,000 homes. The project will connect to the power grid using the existing Ergon Energy infrastructure, located adjacent to the development site. This will allow transmission of power into the Middle Ridge Bulk Supply Substation for ultimate use in the Toowoomba and Darling Downs area. Yarranlea Solar Farm will use the latest Risen Energy PV panel technology and eventually integrate battery storage to allow it to supply power to the grid during periods of peak demand. The completed facility will have an operating life of 30 years, with the option for extensions. At the end of the facilities useful operating life, all physical infrastructure will be decommissioned, and the land returned to its former agricultural use. Risen Energy is a leading China-based PV solutions provider that’s traded as an A-share on China’s Shenzhen Stock Exchange and was founded in 1986. Risen Energy (Australia) has had an established presence in the Australian market since 2008, supplying solar PV panels for the retail market, and funding, constructing and operating commercial and utility-scale solar projects. Risen Energy acquired 100% of the share of Yarranlea Solar Pty Ltd in late January 2018. The Yarranlea Solar Farm project, which will be located approximately 170 km West of Brisbane near Toowoomba, has a total capacity of 121 MW solar power. As owners of the Yarranlea Solar Farm project, Risen Energy will take the project from detailed engineering design to construction, commissioning and thereafter own and operate the solar farm. Once completed the Yarranlea Solar Farm power station will connect to the National Electricity Market, (NEM) via the nearby Yarranlea zone substation and is projected to produce 264 gigawatthour (GWh) each year, enough to power 52,800 South East Queensland households, with an emissions saving of approximately 124,000 metric tonnes of CO2 annually. Yarranlea Solar Farm project commenced in 2016 and is expected to be completed by the end of 2018. Over 200 jobs will be created during the construction phase of the plant which will have approximately 400,000 solar panels installed at the site. Risen Energy will provide their global EPC experience to support the Yarranlea Solar project and will supply the latest PV panel technology and integrated battery storage to allow it to supply power to the grid during periods of peak demand. “There are a number of technical challenges with the generator performance standards (GPS). In discussion with AEMO and NSPs and supported by technical specialists, we secured the offer to connect from Ergon Energy and received approval from the Australian Energy Market Operator, (AEMO), under the National Electricity Rules, clause 5.3.4A for the proposed GPS for Yarranlea Solar Farm. We will continue to work with industrial specialists and consult with local council, electricity authority, regulator and local people to progress the project to the next stage to achieve the best outcome for the project and community” Zhong said. Risen Energy, is a leading China-based PV solutions provider that’s traded as an A-share on China’s Shenzhen Stock Exchange and was founded in 1986. Risen Energy worked quickly this week to resolve an administrative error that led to the temporary delisting of a number of our products from the Clean Energy Council’s list of approved products. All Risen Energy PV modules have now been relisted as of 8 September 2017. We are committed to full compliance with the Clean Energy Council’s certification standards, and we deeply regret the misunderstanding that caused our products to be delisted. Unfortunately, we provided the wrong information to the Clean Energy Council, and there was not enough time to correct the oversight before the deadline for compliance with the new standards. We met with the Clean Energy Council on 29 August 2017 to resolve the matter, and resubmitted our certification documentation. We have also streamlined our certification processes to ensure this error does not happen again. In addition, this experience has given us the chance to review our product information. As a result, we have improved the clarity and accuracy of the information we provide to our customers – eliminating the potential for confusion and enhancing safety for installers. We look forward to continuing to work with the Clean Energy Council to ensure all our products comply with the high standards that the Australian marketplace expects.